A major leak in your hot tub is pretty easy to spot. If you see a big puddle next to your hot tub and it's half empty when you lift the lid... you have a big leak that's losing a lot of water and you know you need to get it fixed. Unfortunately, most leaks in portable hot tubs are so small the water loss is negligable and you may never see water leaking out or pooling up around the cabinet so you don't know you have a problem. A small, prolonged leak inside the sealed cabinet of your portable hot tub traps moisture and exposes all the equipment to a damp environment that causes rust, rot and mold so repairs can cost much more than a major, obvious leak. Leaks in the equipment compartment of your portable hot tub are inevitable. The same vibrations that can loosen electrical connections can also loosen or even crack plumbing connections causing leaks. Luckily, most leaks in the equipment area are easily fixed and even prevented by inspecting and tightening plumbing connections at least once a year. 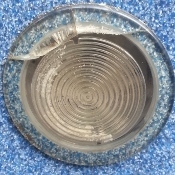 Leaks in hot tub equipment are common and usually easy to fix. The pump union above cracked causing a small, steady leak that was easy to find and repair. The cabinet of most modern hot tubs is well insulated and essentially sealed from the outside environment to improve heating efficiency. Unfortunately, this sealed environment means small leaks inside the cabinet may never reach the outside and the water loss may be so negligible you may never notice your hot tub is leaking. A small, prolonged leak inside the sealed cabinet of your hot tub traps moisture creating a damp environment that promotes rust on all exposed metal components. Moisture trapped inside the cabinet of your hot tub can rust out expensive components. 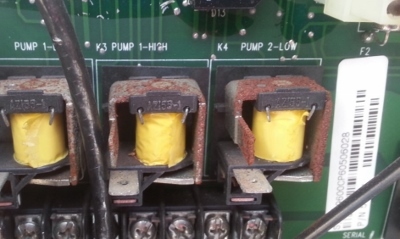 Sometimes, the first signs of a slow, prolonged leak are rusty relays or connectors on your hot tub circuit board. Most modern, portable hot tub use digital display panels and circuit boards to control pumps, heaters and filtration cycles. 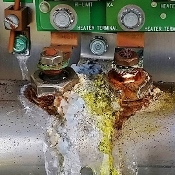 The control panels are waterproof and the circuit boards are dipped in varnish so they are 'corrosion resistant' but prolonged exposure to a damp environment will permanently damage most hot tub circuit bards. 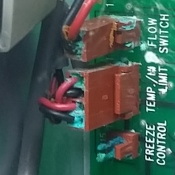 The relays on the hot tub circuit board below were rusted by the damp environment created by a small, prolonged leak on the opposite side of the hot tub. First, you find and fix the leak. Then, you find and fix all the hot tub components damaged by rust from prolonged exposure to a wet or damp environment. Water pooling inside the cabinet of your hot tub can rot wood frames and rust metal frames. The bottom of most portable hot tubs is sealed with a sheet of plastic or spray-foam insulation. This means water can pool up inside the cabinet for weeks or months before you ever see a puddle outside your hot tub. Pockets of pooled up water inside the cabinet of your hot tub will eventually rot wooden frames and rust metal frames from the inside out. 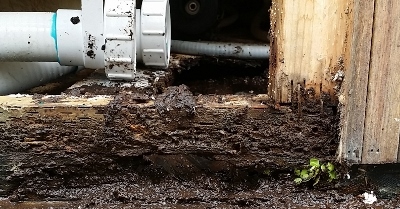 By the time you see the first signs of rot or rust on the outside of your hot tub the insides might be rotted or rusted beyond feasible repair. Replacing or rebuilding the frame on your portable hot tub is possible but it's not economically practical. Your money will be better spent getting rid of the rotted or rusted out hot tub and replacing it with a new tub. The bottom frame of this hot tub was completely rotted through by a small, prolonged leak at a pump union. 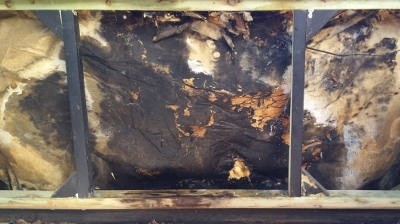 Simply tightening the union every year would have prevented this damage and increased the useful lifespan of this portable hot tub..
Moisture trapped inside the cabinet of your hot tub promotes mold and mildew. Many modern hot tubs are filled with spray-foam insulation to help keep the heat in and reduce heating costs. Unfortunately, this same foam insulation can soak up water like a sponge. 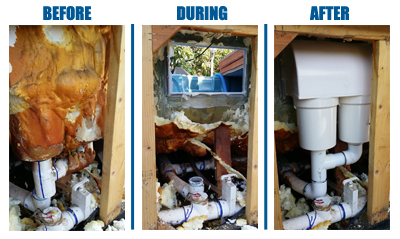 A single, small leak in your hot tub can eventually saturate all the foam insulation on that side of the tub. If a leak continues long enough, water can pool up in the bottom of the tub then wick up into the insulation on all four sides of your cabinet. All this wet insulation will eventually cause rust and rot but the first sign of a clue in locating a small, prolonged leak hidden inside your hot tub is usually wet foam insulation covered in mold and mildew. Locating the source of a hot tub leak that is buried under spray-foam insulation starts with digging out as much of the wet foam as you can reach and then scraping down each pipe and fitting until you find the problem. Click the button below to schedule a Routine Hot Tub Service to preven rust, rot and mold! Before you can fix it you have to find it! Most modern, portable hot tubs have dozens of jets crowded into a relatively small space so the system of pipes and plumbing that connect it all together is complex and usually covered in spray-foam insulation. A single seat in your hot tub might have six jets with each jet body connected to one water line and one air line. 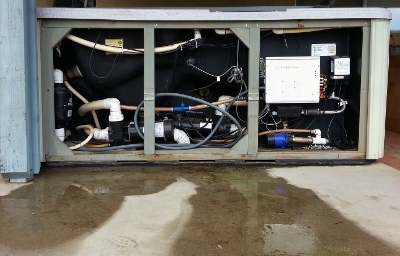 Each water line for each jet connects to a multi-port manifold that connects to a main water line. 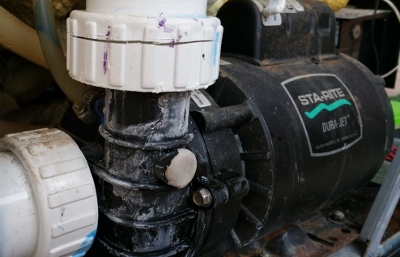 The 2" main water line on the left supplies a multi-port manifold which supplies six, smaller 3/4" water lines that connect to six separate jets. A 1" main air line is connected to a similar manifold that connects six 3/8" air lines to all six jets. 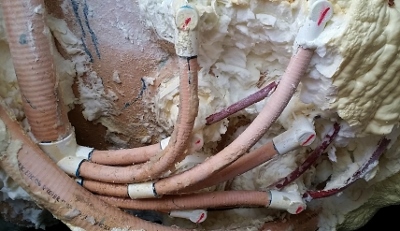 Most of the time, all this complex plumbing is encased and buried within a thick layer of spray-foam insulation that must be dug out and scraped down before a leak can be found and repaired. As a portable hot tub ages the complex, flexible PVC pipes & plumbing gradually become stiff and brittle through a process called surge fatigue. Every time a powerful jet pump turns on a surge of water flexes and stretches every inch of pipe rapidly accelerating the aging process. Repairing leaks in older hot tubs can be difficult if the pipes have become stiff and brittle. Fixing a leak at one end of a pipe can cause an inadvertent leak at the other end because you flexed the pipe too much while you were fixing the first leak. Leak repair in older, portable hot tubs can be slow and labor intensive because every pipe must be thoroughly heated to soften the plastic before cutting or flexing any pipe.